The Philippine government is readying a set of strategies to thwart future cyber attacks. 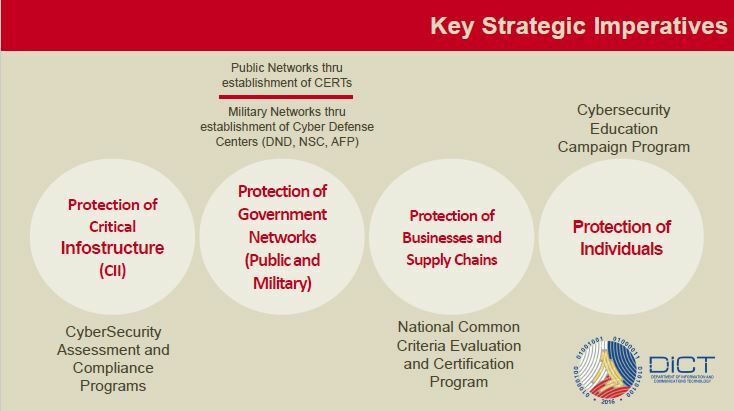 It’s called the National Cybersecurity Plan 2022 and its details were revealed by Allan Cabanlong during the recent Protect 2017 conference in late March. 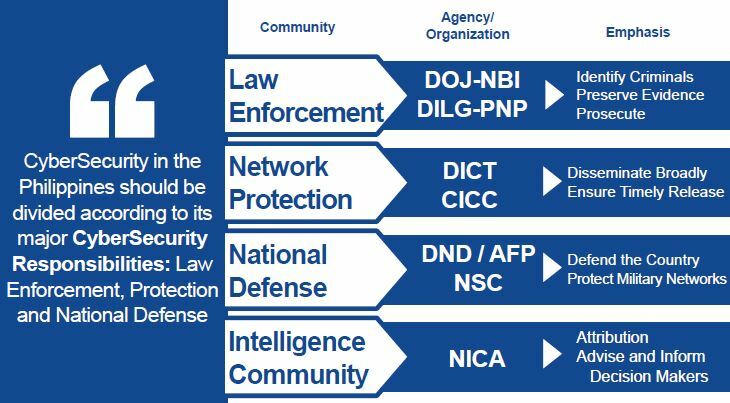 The National Cybersecurity Plan 2022 is a multi-year initiative of the Department of Information and Communication Technology (DICT), a new government bureau established in 2016 whose overarching mission is to improve and help police the Philippine internet. Cabanlong, who comes from a law enforcement background and is an assistant secretary in the DICT, went to great lengths explaining how the plan comes together. It’s a vital undertaking that should grab the attention of those who consider the internet essential for modern states and, like the US military, believe it’s a domain for modern warfare. For professionals in cyber, it reveals how one Southeast Asian country prepares for the dangers lurking in the web. Here are its best parts. On March 29 Cabanlong delivered a presentation about the National Cybersecurity Plan 2022 to an audience of executives and government employees. Its main thrust is training different government agencies for responses to cyber attacks. The slide grab upstairs illustrates the specific tasks for each office or offices. For example, Law Enforcement combines the police and the judiciary to deal with cybercriminals. But for Network Protection the Philippines’ so-called “infostructure”–the sum of its internet connectivity and access–is the responsibility of the DICT and its sub-office the Cybercrime Investigation and Coordinating Center (CICC). When it comes to cyberwarfare, the Department of National Defense (DND) along with the armed forces and the National Security Council (NSC) are expected to deal with the threat. The most limited role is the one occupied by the National Intelligence Coordinating Agency (NICA) that functions as a spy agency should: collecting leads for valuable decision support. “CII” stands for Critical Infrastructure. Governments everywhere recognize the connectivity of today’s workplaces are at risk and this slide categorizes the different kinds the DICT and its partners should look out for. There are attacks on control systems and Internet of Things (IoT) networks for private and public entities. Then there are direct efforts at targeting government websites and databases. Finally, there are the various methods for obtaining restricted access from vulnerable sources to launch cyber attacks. In summation, the DICT must help prepare the Philippine government from all of the above. 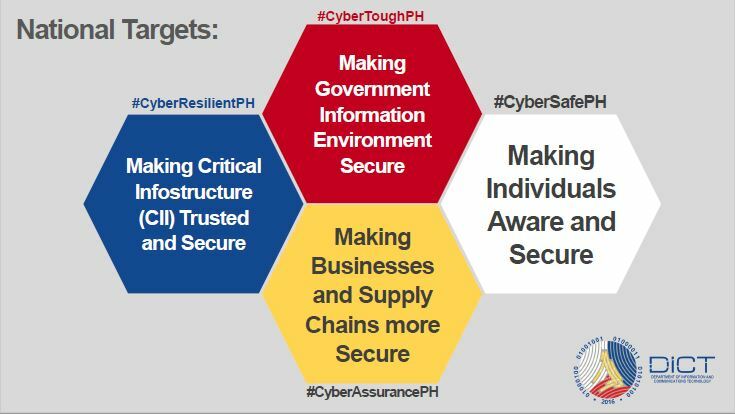 #CyberToughPH : Making government information secure. 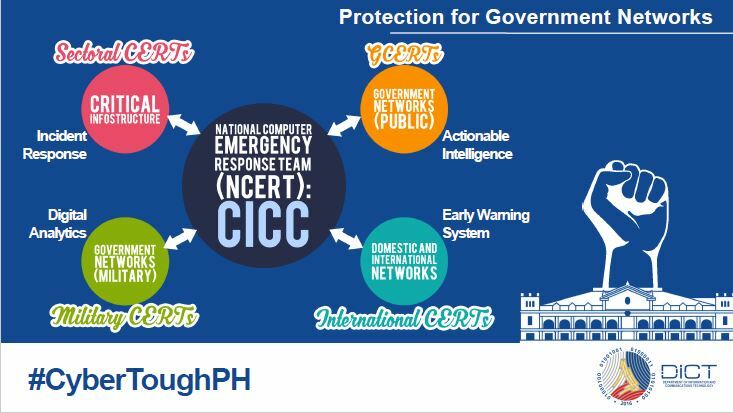 #CyberResilientPH : Making Critical infostructure trusted and secure (for everyone in the Philippines). #CyberSafePH : Making individuals aware and secure. 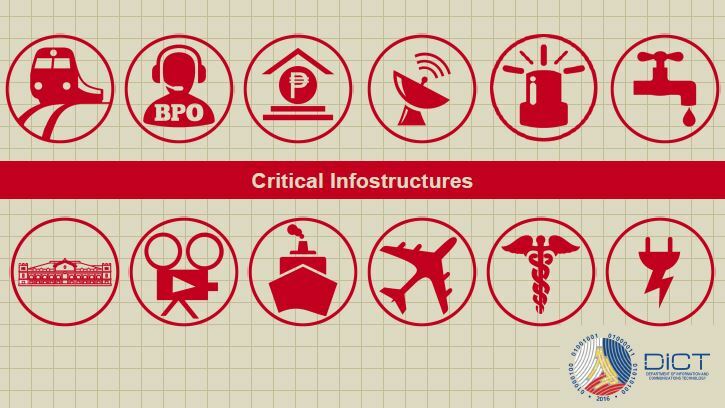 #CyberAssurancePH : Making business and supply chains more secure. These are best summed up as a serious government effort to protect itself, the country’s internet use, Filipino citizens, and business from cyber attacks, points reiterated under the “Key Strategic Imperatives” slide. This is needed to prevent another catastrophic breach like the 2016 Commission on Elections (Comelec) breach where millions of voter biometric profiles were harvested. This particular attack that occurred right before national elections was one of the largest ever done on a specific country. 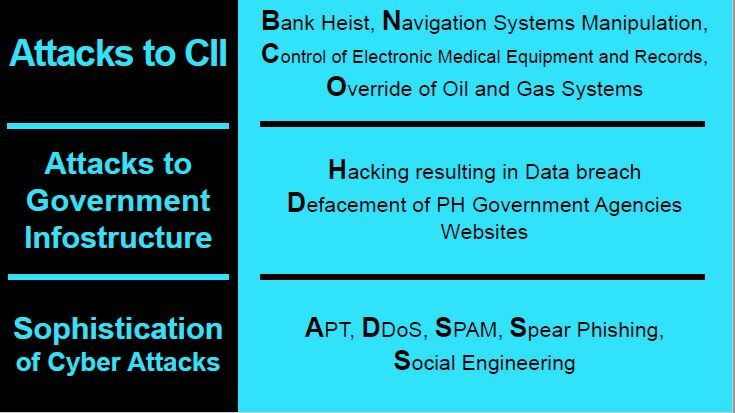 Just to be clear what’s at stake when malicious actors carry out cyber attacks, the graphic above enumerates each. This includes the seat of government and the executive branch, media, maritime and air transport, healthcare, the power grid, the water grid, emergency services, ICT infrastructure, financial institutions, the Philippines’ business process outsourcing sector, and state-owned railways. It’s worth mentioning the business outsourcing sector is a big juicy target because some of the world’s largest companies (including multinational banks) have offshored their accounting, customer service, and human resource tasks to either independent firms or subsidiaries staffed by Filipinos. 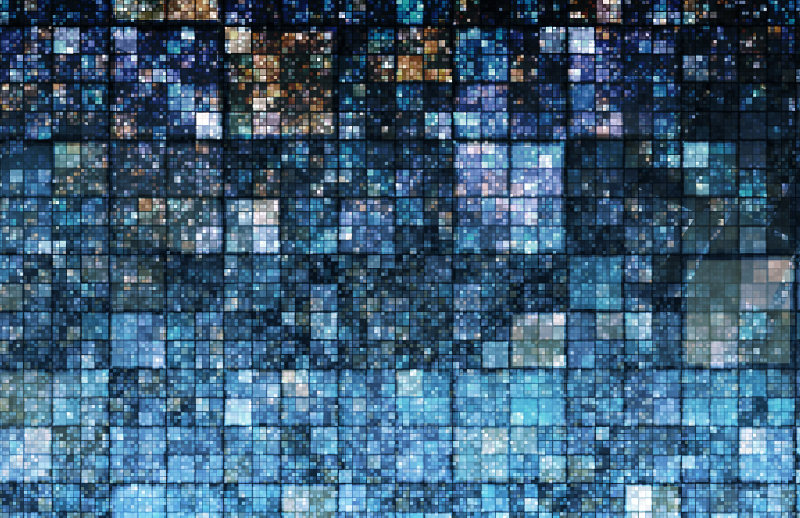 The data that flows into this sector affects millions of lives in North America and Europe. 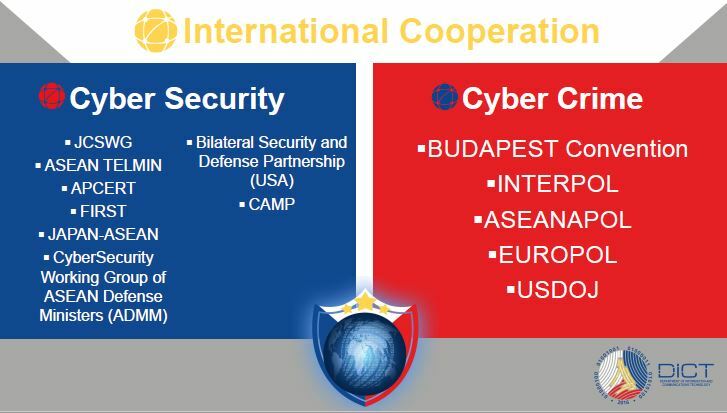 This slide is of particular interest because it names which offices under what agencies conduct cyberwarfare tasks. The NSC, for example, has a mysterious “Threat Operations Center.” What does it do? And how is it different from the military’s own Cybercommand? Here’s another priceless nugget. 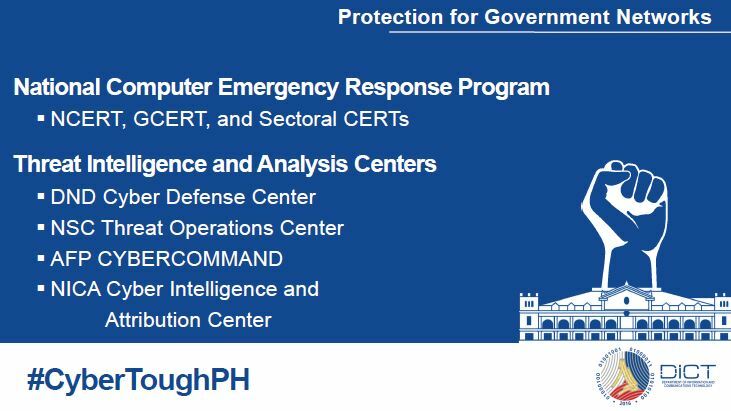 It’s proof the Philippine government is assembling its own Computer Emergency Response Teams for responding to cyber attacks. But the DICT is aware the country needs a talent pool of skilled hackers and misfits. This is why new benchmarks for “educating” prospects are even mentioned. The government, via the DICT, is prepared to train, mentor, and license “cybersecurity experts” for its own ends. As a matter of fact, “Training” for the DICT means a packed course schedule (found on the website under Services) available to both government and private sector employees. Owing to its newness the DICT needs regional and international partners to hone its chops. This slide is the who’s who. Some are obscure like the ADMM while the law enforcement partners are pretty serious. It’s apparent the DICT has its work cut out for it. 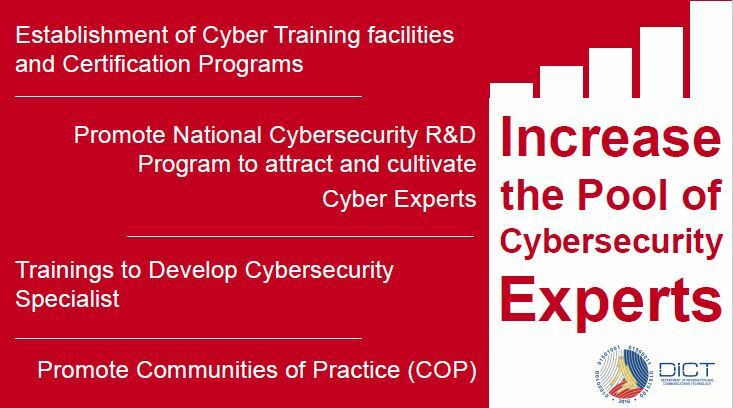 As an institution preoccupied with everything from free public WiFi to certifying ICT workers, the National Cybersecurity Plan 2022 is an endeavor that might save the Philippines in a future crisis.